Space mining start-up Planetary Resources President, Chris Lewicki, made more than one eyebrow rise Wednesday as he wrote in his blog that about $16 trillion of platinum is waiting to be extracted from our Earth’s oceans. However, he also said that mining asteroids is a cheaper and more realistic option. He multiplied the approximate concentration of platinum in seawater, about 2.34E-10 grams per litre, by the amount of water in the ocean —1.3E21 litres— and came to the conclusion that there are approximately 300,000 tonnes of platinum in the seawater. At today’s price for platinum (nearly $1,600 per ounce), this is $16 trillion, he explains. And while it sounds attractive, he says that after processing that huge amount of precious metal, and assuming that there is a plant able to perform the task, seven million years later we would be left with only 300 kg of platinum, worth about $16 million. “Thankfully, in asteroids similar to LL chondrites and iron meteorites that have been studied here on Earth, the concentration of precious metals like platinum is a billion times higher than in the ocean,” says the executive. Lewicki, who worked as flight director for the Mars rovers Spirit and Opportunity, has some successful associates and sponsors who share his otherworldly vision. Planetary Resources’ investors include Google co-founder Larry Page, executive chairman Eric Schmidt and former Goldman Sachs CEO John Whitehead, among others. The best known of all is Hollywood filmmaker James Cameron (Avatar, Titanic). Asteroids are rich in valuable minerals and metals. Just a km diameter M-type asteroid, the third most common type, could contain more than two billion tons of iron ore and nickel. And they are not too far away. 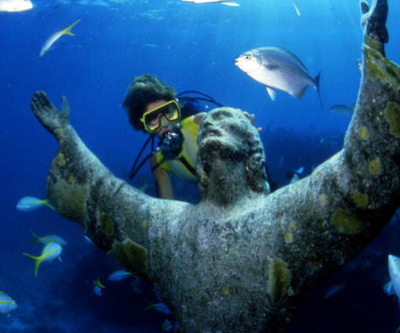 Image: Scuba diver surprised by sight of the "Christ of the Abyss" sculpture at John Pennekamp Coral Reef State Park. State Library and Archives of Florida.